Combining superhydrophobic surfaces with Leidenfrost levitation — imagine a water droplet soaring over a hot surface and not having any physical contact with it — has been studied widely over the past decade by scientists in the hope of uncovering the holy grail of water-repelling surfaces. A team of South Korean scientists from Dankook University and Seoul National University reported an unusual water droplet-bouncing occurrence produced by Leidenfrost levitation on nanotextured surfaces in Applied Physics Letters, from AIP Publishing. Wettability plays a key role in determining the equilibrium contact angles, contact angle hysteresis, and adhesion between a solid surface and liquid, as well as the retraction process of a liquid droplet impinged on the surface. Nonwetting surfaces incline to be formed by either one of the two methods. “First, textured surfaces enable nonwettability because a liquid can’t penetrate into the micro- or nano-features, thanks to air entrapment between asperities on the textured materials,” Lee said. Lee and his team created a unique “nonwetting, nanotextured surface” to probe into the impact of dynamic Leidenfrost effect on the material. Our nanotextured surface was verified to be ‘nonwetting’ via thermodynamic analysis. This analytical approach shows that the water droplet isn’t likely to penetrate into the surface’s nanoholes, which is advantageous for designing nonwetting, water-repellant systems. And the water droplet bouncing was powered by the synergetic combination of the nonwetting surface—often called a ‘Cassie surface’—and the Leidenfrost effect. 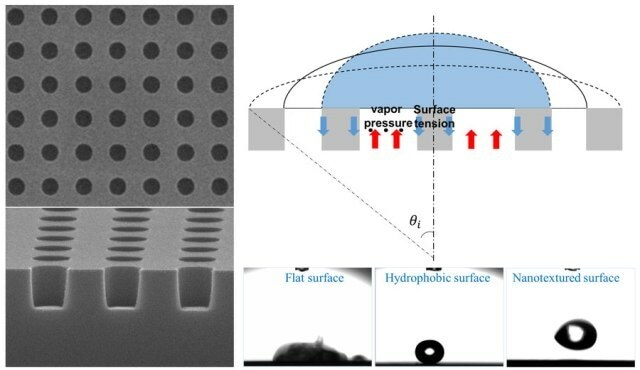 While comparing the nanotextured surface and hydrophobic surface, the researchers found that improved water droplet bouncing was formed by the collective effect of the Leidenfrost levitation and the nonwetting Cassie state. These outcomes should “be of value for a wide range of research areas, such as the study of nonwetting surfaces by the Leidenfrost effect and nanotextured features, enhanced liquid droplet bouncing, and film boiling of liquid droplets on heated Cassie surfaces,” he stated. Significantly, the team’s work advances the basic understanding of droplet-bouncing and the dynamic Leidenfrost droplet levitation occurrences on nanoengineered and hydrophobic surfaces. This indicates that it would be beneficial in the future to produce highly water-repellant surfaces for industrial purpose like anti-fouling coatings, self-cleaning windows, roof tiles, windshields, exterior paints, and textiles. Our future work will focus on developing multiscale structures with microscale and nanoscale regularities, and explore the nonwetting characteristics of their surfaces with the dynamic Leidenfrost effect.